I'm hard to convince, see. But I saw it. I. BACKGROUNDER. 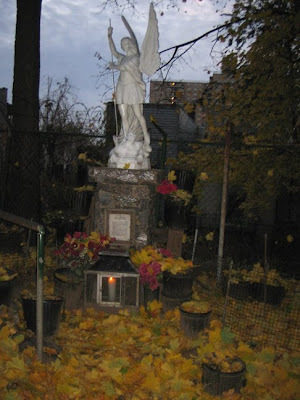 On October 29, 1945, in the very heart of the metropolis, shortly after World War II ended, a nine–year old boy from the Bronx in New York claimed, at a vacant lot, to have seen, spoken to, and prayed with, the Holy Mother of God. It was reported to have been a daily occurrence, lasting until mid–November. Thousands flocked to the scene. The poor, the wealthy, the sick, soldiers, celebrities and religious attended. Miracles and cures were proclaimed. Yes, the event was covered by Catholic periodicals [1–2]. But it was also chronicled in local periodicals, like the Bronx Home News [3–6], the New York Journal – American [7–15], the New York Post [16–17], the New York Herald Tribune [18–19], and the New York Times . The story made national headlines [21–25], with coverage also in Time and Life magazines [26–27]. Life coined the occurrences as the "Bronx Miracle". Not after the alleged apparitions ended, but while events were transpiring, news of the affair made its way north to Canada [28–30] and then to Europe and beyond. By Christmas of that year the story was dead and more or less forgotten. The New York archdiocese did not investigate the matter. It was not until the late 1990s that this case was examined in detail by University of Notre Dame professor J.T. McGreevy , with a couple of newspaper articles in the following years [32–33]. II. Never heard of the "Bronx Miracle"? Neither did TH2 until one late night a couple of years ago, when I came across video interview, conducted in 2003, with the very same boy mentioned in this underreported case related to Our Lady. His name is Joseph Vitolo. Young Joseph Vitolo and the covers of Time and Life magazines in which the "Bronx Miracle" was reported. III. TIMELINE RECONSTRUCTION. Below is a day–to–day reconstruction of events, based on information gleaned from periodicals, including the video interview with Mr. Vitolo (see below). 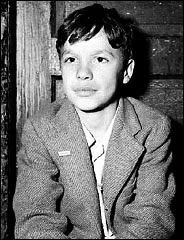 DAY 1 / Monday October 29, 1945: After dinner young 9–year old Joseph Vitolo, Jr., nicknamed "Jo Jo", departed his home at 3194 Villa Avenue to play with children in the area. The spot, just 70 or so meters away his home, was adjacent to a rock ledge/hill, nearly 5 meters in height, on the west side of the Grand Concourse roadway. About 20 children were present. Joseph knew at least five of them: John Bruno (9), Anna Ronca (8), Enid Brown (age unknown), and the Nocerino sisters, Rose (9) and Jeannette (7). The children were looking at something and praying. Joseph did not see anything. One girl told him to "pray like you mean it". Upon praying the Our Father and/or Hail Mary, a lady appeared. Joseph became greatly unnerved, but the she told him not to be afraid, identifying him as "Joseph", not by his nickname. He calmed down. The lady told him to pray. She also gave the boy a candle, reportedly unseen by the other children. The lady requested him to return to the same place at the same time (7 pm) the next evening. The other children saw the lady but did not hear her speak. Joseph explained his interchange with the lady to the children and rushed back home to tell his parents of the incident. His father, Joseph, Sr., did not believe his son, and proceeded to give him "a slap". In a later report, his mother, Theresa, is quoted: "I didn't know what to say. My Joseph has always been a good boy and goes to church. He never lies to me" . Mrs. Vitolo encouraged him to return to the spot. Indeed, Joseph returned and once again the lady allegedly appeared. Joseph began to tremble. At this appearance the lady said she would return to the same location for the next sixteen consecutive nights. [No information was found by this author regarding what happened immediately after Joseph's alleged second encounter on the same day]. DAY 2 / Tuesday October 30, 1945: Hearing about the incident, people in the immediate area attended the site, carrying Rosaries and votive candles. These candles were placed on the ground in the shape of a cross. Passing motorists noticed the gathering of people and stopped to check out this happening near the intersection of the Grand Concourse and Van Cortlandt Avenue in the Bronx. Parishioners at St. Philip Neri Church, located a few blocks to the south on the Grand Concourse, were in attendance. Prayer and prostrating persons at the site were reported. The "sick" were arriving . It was at this time that someone living nearby the Vitolo residence notified the press of the goings on. 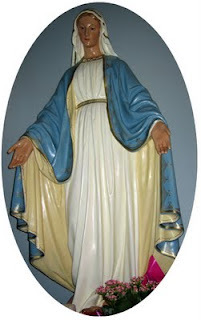 For this and remaining nights, at 7:00 pm, Mr. Vitolo stated that he would pray an Our Father, a Hail Mary, a Glory Be... and then Our Lady would allegedly appear (Video 1, 5:23+). To him, it seemed that the appearance of the BVM lasted 5 to 10 minutes per evening (Video 1, 8:37+). However, he further states that observers "clocking" him at 55 to 60+ minutes. Young Joseph was immovable whilst in prayer with the BVM. Many witnesses claimed that that, excepting a center–situated votive candle, the remainder suddenly blew out. 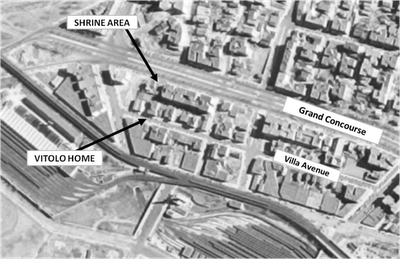 TH2 Note: Pilgrims attending the site at the Grand Concourse, praying at shrine, located on an elevated rock formation. Notice the solemn, downward–looking faces of the ladies in the foreground. Much suffering there. Many mothers who lost their sons during the war came to the shrine. Wounded soldiers requested that Joseph visit them at the local veterans hospital. He did, lifting their spirits. Dated: November 12, 1945 / Corbis. DAY 3 / Wednesday October 31, 1945: A small altar was built at the site by Joseph and volunteers during the afternoon. Pilgrims placed votive candles thereon, in the shape of a cross. According to McGreevy [31, p. 409], on this evening "Joseph claimed that the lady had asked him if he knew Bernadette; he replied 'no'. Then she told him that Joseph must do as Bernadette did. Some in the crowd 'made no secret of their scepticism' but quieted when, once again, the candles on the ground mysteriously blew out". A newspaper article reports that more than 500 people gathered at the site on this (third) night . DAY 4 / Thursday November 1, 1945: According to McGreevy [31, p. 409], at "7:00 p.m., a weeping Joseph clambered up the ledge with only his mother, Theresa Vitolo, and a sister, also Theresa". One report said that 3000 persons were in attendance . Original Corbis Caption: "Woman who fainted while watching nine year old Joseph Vitolo pray in a vacant lot in the Bronx is carried into a nearby house by her sailor husband and a bystander. Woman was reported to have suffered a heart attack. She was taken to a hospital after prayers by Vitolo". TH2 Note: Notice the lazy guy leaning against the wall in the background. Hey, buster... give'em a hand! Dated: November 14, 1945 / Corbis. DAY 5 / Friday November 2, 1945: This evening the makeshift altar was illuminated by 35+ votive candles. Of what transpired, one article relates: "Joseph approached with Robert Porras, 16, by his side. Robert said he intended to study for the Roman Catholic priesthood. Joseph said he saw the vision as he knelt in prayer... He said he asked whether his friend Robert should become a priest. 'She [the lady] said if he will study hard, and go to church and pray and be cleansed of all his sins, he can become a priest... She told me [Joseph] the people should build a church here', he added" . The Associated Press further quoted Joseph as saying that "she would be back tomorrow". The apparition allegedly occurred while "persons of all ages, degrees of piety, curiosity and scepticism looked on". DAY 6 / Saturday November 3, 1945: "Miracle" claimed by mother of crippled child . Original Corbis Caption: "John Pace, a soldier back from overseas, brings his sister, Caroline, to the Vitolo home to beg Joseph to pray for her. Left to right are Ann Pace, John Pace, holding sister Caroline, and Joseph Vitolo stands on a bed praying." TH2 Note: This is an extremely heart–wrenching photograph (notice Caroline's face). I sure hope that, in whatever way, the little pumpkin's suffering was alleviated. DAY 7 / Sunday November 4, 1945: No information obtained. Likely, by this time Joseph was being escorted to the shrine site. His cousin, Frank Rufino or his "godfather", would carry him there just before 7 pm. This was because of the requests of the assembling crowds, wanting Joseph to touch them, grabbing pieces of his clothing, cutting off pieces of his hair, and so forth. 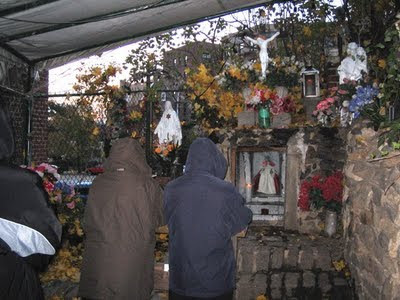 DAY 8 / Monday November 5, 1945: People from outside New York were making pilgrimages to the shrine. The site was monitored continuously to prevent desecration. At around this date Joseph stopped going to school. From this time onward he was effectively confined at his home, praying over a steady flow of visitors on a daily basis. "Lines of people, mostly sick people or those escorting sick people, squeezed into his family's small dilapidated home on Villa Avenue each evening. Neighbour Joseph Castaldo tried to keep order: 'Only one person can talk to him at a time!... Don't crowd or push – he'll see you all' ". Crowd attendance for this evening was estimated at 8500. DAY 9 / Tuesday November 6, 1945: No information obtained. 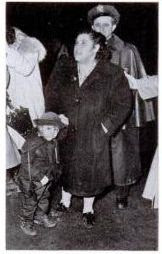 However, it was probably at around this date or soonafter that, firstly, Cardinal Spellman dropped by for a visit and, secondly, young Joseph was taken to see Monsignor Sheen at his broadcast studio in Times Square (see below). TH2 Note: Joseph being carried to, or back from, the shrine (likely by his cousin and/or godfather, Frank Rufino). This had to be done because the crowd wanted to touch Joseph, kiss his hand, cut pieces of his hair, pull buttons from his clothing, etc. In the video interview, Mr. Vitolo describes himself as being "happy" in the anticipatory minutes leading up to his alleged meetings with Our Lady at 7:00 pm EST. Date: 1945: Day not specified / Corbis. DAY 10 / Wednesday November 7, 1945: No information obtained. DAY 11 / Thursday November 8, 1945: No information obtained. DAY 12 / Friday November 9, 1945: Attendance estimated at 20000 . DAY 13 / Saturday November 10, 1945: No information obtained. DAY 14 / Sunday November 11, 1945: No information obtained. DAY 15 / Monday November 12, 1945: No information obtained. TH2 Note: Joseph praying at the shine on the 15th night of the alleged apparitions. In the video interview, Mr. Vitolo states that Our Lady's height was about the same as his own at the time. Notice that young Joseph is not looking up or down, but nearly straight ahead. DAY 16 / Tuesday November 13, 1945: And area of four blocks circumscribing the site was monitored by police, blocking traffic therein. The shrine spot itself with cordoned off with ropes. People said the Rosary and sang hymns. The shrine itself now had 200+ candles, hanging Rosaries, with emplacements of flowers and religious statues. "Joseph tossed carnations to members of the crowd. Women suffering from hysteria were pulled from the crowd by police and driven to nearby Fordham Hospital" [31, p, 410]. Crowd attendance was estimated at 15000 to 20000 [17, 18, 31], arriving by foot, cars and buses . "I won't tell you what she [the lady] told me, he [Joseph] shouted at reporters... 'She told me not to tell'. 'Shut–up Jo–Jo', his sister ordered'. Beyond that, the boy refused to talk" . (1) "The night began like the previous nights... But the crowd was larger and almost 100 policemen were detailed to handle it. Joseph, led by [Frank] Huffino [name misspelled, should read Rufino], pushed his way to the altar which was decorated by a statue of the Virgin Mary and 56 candles. The crowd sighed as he reached the altar... Joseph began praying. Many echoed his words. A group of girls began singing softly and the rain increased its constant patter. 'He isn't getting wet', someone whispered, and it was passed through the crowd... Then, near the end of his prayers, a photographer used a flash bulb. 'That's when Jo–Jo got mad', Huffino [again, Rufino] said later. 'he didn't like that'... James Sheridan, 44, said 'I'm hard to convince, see. But I saw it. It was there on the side of the building. I saw the virgin's figure, just as plain as anything'. 'Did you see the sky?' asked Mrs. Julie C. Murphy of Manhattan. 'I tell you the clouds just opened up and I saw an angel's head with butterfly wings. Everyone around me saw it. The crowd was in a panic' ". (2) "Joseph was again carried to the shrine, this time surrounded by his six brothers and sisters. A priest led the saying of the rosary and several hymns were sung. A steady rain made the view from the apparition site a sea of black umbrellas. Some in the crowd speculated that Joseph was not getting wet. One hundred policemen kept order. The well did not appear, and Joseph denied ever having promised that a well would appear. A break in the rain when he finished praying led to cries of excitement, even as photographs show a more raucous, perhaps skeptical, segment toward the back of the crowd... [Afterward] Joseph returned to his house, and family members refused to let him answer the questions of reporters, although one photographer caught Joseph hurling a bouquet of flowers at a persistent cameraman. Joseph's sister, Theresa, addressed the press after the final evening. She insisted repeatedly that the Virgin had told Joseph: I'm not coming anymore. I did my work and I do not want you to answer any more questions' ". (3) "As elevated trains rattled overhead and photographers' bulbs flashed, 25,000 persons stood praying in the mud of a vacant lot... watching Joseph Vitolo, Jr., pray at an improvised altar on the crest of a bluff... on the sixteenth day, he said she [the lady] was to show him a miracle, perhaps the appearance of a miraculous spring. The crowd saw no miracle but several invalids claimed their condition had suddenly improved... 'Hail, Mary, full of grace, the Lord is with thee...' chanted the swaying crowd in unison. The boy knelt before his altar... 'Look, look,' spread a rumor through the lot. 'He is not getting wet. The rain does not touch him'. But those who were closest could see the rain glistening on his dark hair and new blue sweater as he knelt in the mud... Yes, he said, he had seen the Blessed Virgin again." TH2 Note: Crowd (total) in attendance estimated at some 25000 to 30000 on the last night of Our Lady's alleged appearance. IV. VIDEO INTERVIEW. This interview of Mr. Vitolo (in 2003, he was 66 years old at the time), was conducted by Paula Gloria (Tsakona) of The Concordia Foundation. Some internet searching evidenced that, despite her enchanting voice, Ms. Gloria is a couple of french fries short of a Happy Meal, as her website endorses an admixture of conspiracy theories and gnosticism. Nevertheless, the interview was performed respectfully, with the exception of a few howlers (e.g. Vitolo is misspelled as "Vitello" in credits). Ms. Georgia is the principal questioner. Occasionally you will hear a male voice posing questions. Both interviewers are off–screen. The interview is to be found on YouTube, in two parts, each lasting approximately 30 minutes. TH2 embeds them below. Video and audio is subgrade quality in some parts. Audio loss occurs for approximately two minutes in Video 1 (between 9:44 and 11:21). Summaries for Videos 1 and 2 are respectively in the notes below [35–36] for any reader unable to spend a full hour watching. V. REPORTED APPEARANCE OF BVM. According to the video interview, Mr. Vitolo states that Our Lady appeared "very human" (Video 1, 5:23+). Her height was, allegedly, not much taller than his (as a boy), about 5 feet. (1) Clothing/Apparel: She was dressed in blue at her first appearance (October 29). But later, following a specific question on the matter, he states that that she also wore pink and black (Video 1, 22:40+). The McGreevy article [31, p. 406], indicates somewhat differently, attesting that she "dressed first in white, then in blue, then in black". When young Joseph returned to the rock ledge for the second time on the first evening (on the insistence of his mother), Our Lady was said to be holding a batch white roses and wearing a crown. Nonetheless, Mr. Vitolo states she wore a different color every night. One report, referring to the third or fourth night of the alleged apparitions, indicates that the "vision was not dressed in white with a rose on her breast as she had been the other nights, Joseph said, but 'she wore a pink gown, had a gold crown on her head and red shoes trimmed with gold on her feet' ". Regarding the last night, a newspaper quotes young Joseph as saying: "She had lots of stars around her head... and she was dressed all in blue". However, in the video interview Mr. Vitolo is quite insistent that, on the last night of her reported appearance (November 14), Our Lady wore all white with a gold Star of David. It is this image on the last night – emphasized by Mr. Vitolo – by which Our Lady wished to be remembered. This likeness is rendered in the painting situated behind Mr. Vitolo in the video interview (see image of painting below). (2) Voice: Mr. Vitolo is almost at a loss for words in characterizing her voice, i.e. "it was so beautiful, I couldn't describe it", more at it sounded like "music from heaven" (Video 1:, 22:40+). Recall that young Joseph was afraid when he first saw the lady but, after hearing her voice, "ìt calmed me down". (3) Olfactory: Mr. Vitolo also indicates a pleasing odour when the BVM was present, a "beautiful smell", acknowledging the word "perfume" as a descriptor (Video 2, 21:20+). VI. "OUR LADY OF THE UNIVERSE" PAINTING. The artist who painted this image (see below), from Connecticut, was retained by Fr. John Santyr, the priest who later married Joseph and his wife, Grace. 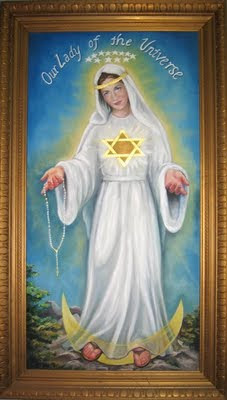 Joseph reported that, in 1945, a Jewish woman , after receiving "some kind of grace", left a statute of Our Lady with a gold Star of David on its chest. Joseph said that was how the BVM appeared on the final night and asked that the painting be rendered as such. In 1996 the painting was meticulously examined as there were claims its colors had "shifted" [31, p. 432]. Results of this examination are unknown to this author. TH2 Note: This is the painting seen behind Mr. Vitolo in the video interview. Now known as "Our Lady of the Universe", the title "Our Lady of the Concourse" was originally conferred right after 1945. 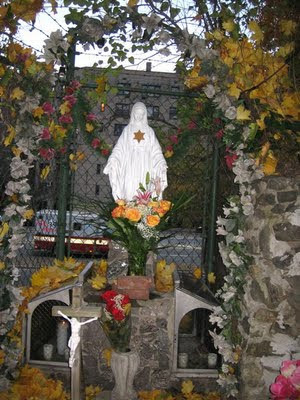 This is because the BVM reportedly appeared adjacent to the Grand Concourse roadway. Notice the emanating Star of David and the gold band around Our Lady's head. Also interesting (not referred to in the descriptors assessed here) is the crescent moon under her feet. Traditionally, the crescent moon symbolizes Our Lady's triumph of perpetual virginity over pagan fertility cycles and, also, her role in cosmic events (cf. Revelation 12:1). VII. REPORTED MESSAGES/WORDS SPOKEN. According to Mr. Vitolo (Video 1, 5:23+ / Video 2, 29:29+), the main message the BVM communicated was to say the Rosary and pray "for peace in the world". When the sound returns at 11:21 in Video 1 (audio loss begins at 9:44), we hear Mr. Vitolo saying that, for the first 4 or 5 nights, the BVM answered requests by pilgrims. The video is unclear (because only the tail end of the conversation is captured), but it seems as though Joseph was given envelopes with questions latterly submitted to the BVM, that she allegedly answered. Other than those abovementioned newspaper quotations attributed to the BVM (relayed by young Joseph), no other message was found by the author. Mr. Vitolo: ...and the bead is still there. Male Questioner: Well, talk about that. What happened? Mr. Vitolo: Well, not rosary beads. They... they were blue, blue beads. Mr. Vitolo: They were blue. They weren't white. They were blue beads... and the beads broke. I couldn't... I couldn't move. I must of... stopped me for some reason... and, ah, Our Lady stooped down, picked up all her beads, and she says to me: "One bead", she says, "Joseph, we can't find". Paula Gloria: She said... she said that to you? Mr. Vitolo: One bead... Scholars, priests... all these people... they tried to figure out what that meant. Male Questioner: Like she purposely left it there, huh? Right? Mr. Vitolo: [Acknowledges]... and then when she left the last night, she didn't say goodbye. She just left like she was coming back the next time. So I feel that she might come back. She might come back get that bead. Maybe I'm the bead. She's going to come and... I don't know. Now immediately does this question comes to the fore: Were the beads mistakenly broken or were they broken intentionally? If the former, then it implies that Our Lady had "fumbled" in some way – but this would be beneath the immense grace and dignity of the BVM. Definitely, if this was the case it would be a blaring red flag indicating that something was rotten in Denmark. If the latter, if the beads were purposefully "broke" for a reason – then the alleged comment made by Our Lady would require further inquiry. Still, it would not necessarily authenticate the apparitions per se as divine or even, speculatively speaking, demonical. What is confusing is that Mr. Vitolo said that the beads "broke", but this statement infers that the beads were somehow interlinked, as in a Rosary. But Mr. Vitolo states that they were not Rosary beads. If they were not connected, then how can a bead or beads "break"? I have found no further information on this episode. Rather than just reading the exchange as quoted above, readers would gain greater appreciation by viewing this segment, discern and then judge for themselves. IX. REPORTED CURES. Various cures and healings were claimed during the period of the reported apparitions. Sporadic mentions are given in newspaper articles. However, no medical confirmations or other information was found by the author to authenticate these claims. It is interesting to note that Mr. Vitolo claims that Our Lady gave him two "gifts": healing by touch and the ability to tell the "personality" of someone by looking at them (Video 2, 19:14+). He further claims that she gave him a Miraculous Medal that cured others but, over time, got lost in the "shuffle" (Video 2, 3:01+). Caption from Life magazine  on claimed cure: " 'He's cured my boy's paralyzed finger', says Mrs. Phillip Miller. Joseph touched child's hands." 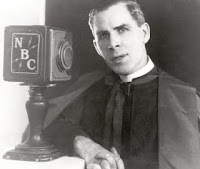 Monsignor Fulton Sheen (1895–1979): His radio broadcast studio at the time was located in Times Square, just 15 kilometers southwest of the Shrine site. Sheen closely monitored the happenings. One day during November 1945, Joseph was taken to meet the Monsignor at the studio and related the story of his visions. According to McGreevy [31, p. 410], "Sheen gave Joseph a dollar bill after the interview and told him to have lunch at the automat." The automat! I am surprised to hear that a man known for his immense charity would send a poor little guy to a vending machine for lunch. I mean... come on. Perhaps it was a more meaningful gesture in those days. TH2 has never came across any mention of this incident in Sheen's writings. Cardinal Francis Spellman/Archdiocese of NY (1889–1967): The Big Cheese, the "Chairman of the Board" (more so than Sinatra, see below) – Spellman had a run in with Sheen in later years (sending the latter to Rochester, NY) – had, according to McGreevy [31, p. 410] "arrived at the house late one evening in a limousine and chatted privately with Joseph for a few minutes". Spellman arrived with "a retinue of priests". The archdiocese did not formally pronounce upon on the matter, and its newspaper only advised caution. Logically, the decision not to open up an investigation (apparently, records not available) was likely connected to a determination made by Spellman. This is a deduction based on the assumption of the Cardinal's jurisdictional powers, not reported facts. He was also in Life magazine just a few months after the reported occurrences. 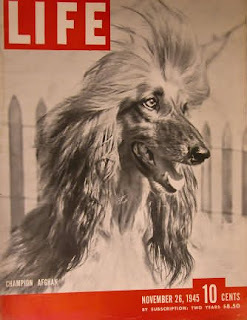 Indeed, he upstaged Joseph and made it on the front cover of the January 21, 1946 issue. Bella Dodd/Ex–Communist Catholic Convert (1904–1969): Member of the Communist Party of America (CPUSA), expelled therefrom in 1949. Later convert to Catholicism, baptized by Fulton Sheen in St. Patrick's Cathedral, New York in 1952. In the aforementioned video interview (Video 2, 7:10+), Mr. Vitolo indicates that, ailing and in a wheelchair, she came to see him, telling of Communist infiltration into the Catholic Church and concern for the welfare of her son. Reportedly, Dodd also spoke similarly to Alice von Hildebrand. 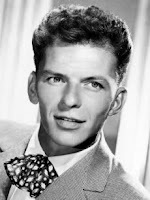 Frank Sinatra/Glorified Lounge Lizard (1915–1998): It was rumored that "Ol' Blue Eyes" visited the Vitolo residence sometime during the visions. Image is from a 1945 publicity shot. According to a 2002 interview, Mr. Vitolo states that he "just saw the back of him". Sinatra is said to have brought a statue of Our Lady as a gift (see image juxtaposed, located in Vitolo home). Lou Costello/Comedian (1906–1959): The radio/film comedian of "Abbot and Costello" fame is also claimed to have dropped by the Vitolo household to check things out. Facts are unclear about his attendance. If Costello did not visit, a newspaper article in 2002 indicates that he "sent a small statue encased in glass" to the Vitolo residence. Eleanor Phelps/Actress (1907–2001): A film and television actress who, according to IMDB, starred as the character "Charmion" in Cecile B. DeMille's Cleopatra (1934). Phelps also appeared on one episode of the depressing TV show Kate & Allie as late as 1989. Mr. Vitolo, in the video interview above (Video 2, 7:10+), mentions meeting Phelps, a "very beautiful" woman that lived a "sumptuous" life. Reportedly, at the shrine Phelps heard Our Lady tell her to "amend" her ways. Phelps converted thereafter, according to Mr. Vitolo. There is some evidence for her conversion as Phelps, based on the aforementioned IMDB link, appeared as an "Old Woman" on three separate episodes of The Catholic Hour in 1967. TH2 could find no photo of Phelps on the internet. 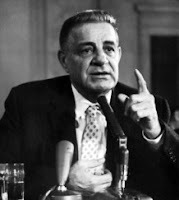 Joe Valachi/Mobster (1903–1971): A New York mobster from 1930 onwards. Thug, murderer, Mafia informant and likely mentally insane. Mr. Vitolo, in the video interview (Video 1, 14:11+), mentioned that he had a crush on a girl as a boy, but it never worked out between them. He footnotes that this same girl later married the son of Joe Valachi. Just an interesting factoid. XI. REACTION OF MEDIA / INTELLECTUALS. The general reaction at the time by newspapers covering the alleged apparitions was scepticism, which is expected and understandable. However, not much effort was done to substantiate or refute certain claims. For example, articles repeatedly claimed that the BVM promised Joseph that a water spring would miraculously appear at the site. Mr. Vitolo made it explicitly clear in the video interview (and in other written reports) that the BVM never told him about the emergence of a spring (Video 1, 22:40+). Life magazine  had the following captions for these two photographs, respectively: (1) "A paralyzed invalid is carried from the lot to a waiting car. Joseph had failed to help him"; (2) "Converts dig in the mud where Joseph prayed, still convinced that there must be a well there". One of the most loathsome responses from the media of the event came from Time magazine. An air of condescending amusement bleeds from the opening sequence of the article: "Once upon a time there was a little boy whose parents were very poor. They lived in The Bronx, in a drab backwash of a great city. Joseph Vitolo Jr., nine years old and small in the underfed fashion of the poor, was the 18th child (nine still living) of an immigrant Italian who makes a little money working on an ash truck, and a fat Italian mother who helps buy food by cutting flowers out of cloth." Notice: "Once upon a time...", i.e. a fairy tale; "...an immigrant Italian who makes little money working on an ash truck", i.e. contempt for a man with a humble occupation; "...a fat Italian mother", etc..
A couple years after the event, R.W. Marks wrote a book on hypnosis. He briefly comments on the occurrences, hardly in a scientific fashion, with that same contempt exhibited by Time: "The son of an Italian garbage collector set blasé New York agog in the fall of 1945... Joseph [Vitolo] was automatically assumed to have saintly magic of the great touchers... So great was the hypnotic effect of the situation that the crowd soon began to create its own 'miracles'." No information is presented to evidence that the crowd produced its own miracles. 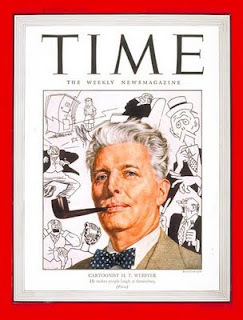 Another criticism of the "Bronx Miracle", void of objectivity, came from the pen of the notorious anti–Catholic bigot Paul Blanshard (1892–1980, see adjacent photograph), who discussed it in The Nation – a magazine that today is still run by radical left wing nut jobs . Blanshard, a lawyer and an exemplar of that kind of secular humanist slug whose lifeblood consists in attacking Christians, saw Roman Catholic conspiracies everywhere. Most notably, this joi de vivre anticatholicus was given in his book American Freedom and Catholic Power (1949). XII. THE PROMISED "MIRACLE" ON NOVEMBER 14, 1945. In the 2003 interview (Video 1, 22:40+), Mr. Vitolo spoke that the BVM told him that "something wonderful would happen" on the last night of her appearance. Furthermore, he states that, as he was taken back to his home (after alleged apparition on that night), persons in the crowd exclaimed "look look look". He said the "sky opened up", but saw nothing else. Over the years, various persons in attendance in 1945 have told him that they saw Our Lady ascending upward after the alleged opening up of the sky. Mr. Vitolo said he did not see the latter. TOP: Low oblique Google Earth image of shrine site and area. 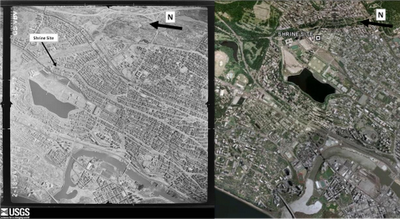 BOTTOM: Comparison of aerial photo of subject area on February 18, 1954 (earliest available) versus modern shot acquired from Google Earth. Historical image acquired from United States Geological Survey (USGS). Click images for larger size and greater clarity. Now whether or not persons in the crowd saw the Blessed Virgin ascend, or angels transiting skyward, is impossible to demonstrate. However, by examining past atmospheric and astronomical conditions, a little scientific check can be done on the phrase "the sky opened up". What does this phrase mean specifically? An opening up of the starry celestial dome into "heaven". But, again, this cannot be assessed scientifically. Perhaps a parting of the clouds aloft? One witness to the event said "the clouds just opened up"  – and this can be examined scientifically, i.e. whether or not clouds were present at the time. Historical Atmospheric Data: An examination of historical weather records held at the National Climate Data Center (NCDC) at Asheville, North Carolina, shows that one of the closest weather stations to the relative to the Shrine site was located in Central Park, NY (approximately 10 to 14 km to the southwest). Copies of the original data record for November 1945 is embedded below. In addition, surface weather maps for the time are archived by the U.S. Daily Weather Maps Project of the National Oceanographic and Atmospheric Administration (NOAA). These, too, are embedded below, for the period November 13 to 15, 1945. TOP: Weather records at Central Park, New York station for November 1945. BOTTOM: Surface weather maps for contiguous United States on November 14 and 15, 1945. Click images to enlarge. Rainfall and Cloud Conditions: The weather maps, by giving a birdseye view of atmospheric conditions across the continental United States, show that a generally eastward moving cold front had traversed across the northeast U.S., including the New York area, from November 14 to 15, 1945. Behind this cold front was a linear band of precipitation, in the form of rainfall (denoted with grey shaded areas). The black circular dots on the map, comprising part of the "station model" for a particular location, indicate 100% coverage of the skydome by clouds, i.e. overcast conditions for the New York area. The climatological station report for the Central Park weather station shows that, on November 14, rainfall occurred (column 4, denoted with "R", 0.24 inches) and 10/10ths the sky was covered by clouds (i.e. overcast skies, column 10). Accordingly, the historical weather record is consistent with claims by witnesses of rainfall and clouds on November 14, 1945. Illumination/Visibility Conditions: But now the following question arises: If it was dark between approximately 7 and 8 pm EST on November 14, 1945, how could the cloud deck (allegedly said to have "opened up") have been "seen"? The latitude–longitude of the Shrine site is about 40o53' N / 73o53' W. For this location on November 14, 1945, sunset would have occurred at 4:38 pm EST. The end of civil twilight would have eventuated at approximately 5:08 pm EST (determined from computations by the United States Naval Observatory, USNO). So, indeed, it was dark at the time. Accordingly, if the cloud deck was able to have been visualized, illumination sources need to be identified. The two main sources of illumination, then, would have been the moon (if present in the celestial dome) and artificial lighting. 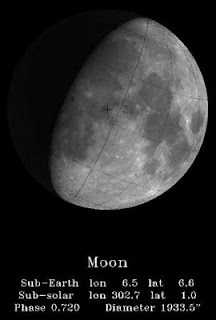 A check again (with the USNO) indicates that, for the subject site – between 7 and 8 pm EST on November 14, 1945, the moon was existent above the horizon, in the southwestern sector of the sky, with 72% of the lunar disc illuminated. The geniuses at the USNO have also created a computer program to synthetically generate what the moon would have looked like on that night (see embedded image). However, the moon was very low in the sky, just a mere 3 to 5 degrees above the apparent horizon. 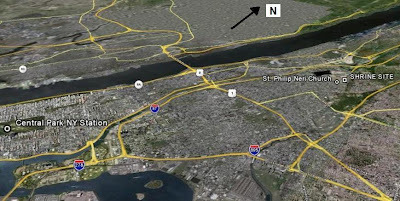 Given that the Bronx is an urban center, buildings likely would have blocked direct lunar light emanations, dependent upon surface configurations of the terrestrial background (see close–up aerial image immediately below). Moreover, as evidenced above, skies were overcast, and thus lunar light would have been diffuse at best. However, Life magazine gives this comment: "As Joseph was carried home, tired and nervous, the moon suddenly came out in the western sky, casting a blue light over the people and the lot. 'A miracle', sighed the converts in the crowd". Could this, then, have been when the sky "opened up"? It suggests a break in cloud cover to allow a surface observer to see the moon. Perhaps it was when the clouds broke at this time, in a darkened sky, that a contrastingly bright astronomical object gave the appearance of a sky that "opened up". This statement is not a negation of a miracle, but simply an opinion on meteorological conditions. LEFT: Synthetically-generated image of moon as it appeared on the evening of November 14, 1945. RIGHT: Close-up of subject area from February 18, 1954 aerial photograph. The most likely source of significant illumination would have come from man–made sources throughout the New York area (street and building lights, etc.). Even in 1945, the sky above "city that never sleeps" was extraordinarily bright at night. Today this is called "light pollution" (a stupid phrase). There is an illumination condition, particular to cities, called "cultural lighting", where light originating and emanating upwards from urbanized areas is reflected back to the land–surface by the base of a cloud cover. If a night is cloudy, an observer at the outskirts of a city can very often see the cloud base. All that these cloud, precipitation and astronomical data evidence is that atmospheric and illumination conditions at the Shrine site, on November 14, 1945, were conducive to allowing a surface observer to visually resolve the cloud deck aloft between 7 and 8 pm EST. No more. No less. Ignoring the aforementioned comments on the moons appearance as reported by Life magazine, the term "the sky opened up" implies a quick separation of discrete cloud elements, but this is not what happens if one, say, on a cloudy day, looks at the clouds. One can see clouds move, develop and dissipate, but this transitioning is slow and gradual. The phrase "opened up" suggests rapidity and/or instantaneousness. Circular "holes" in cloud decks have been observed and analyzed in the scientific literature. 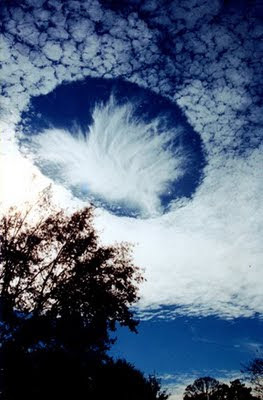 They are called "hole–punch clouds" (see photographs below). But again, this condition develops gradually and thus cannot explain the apparently fast speed to which the "sky opened up". 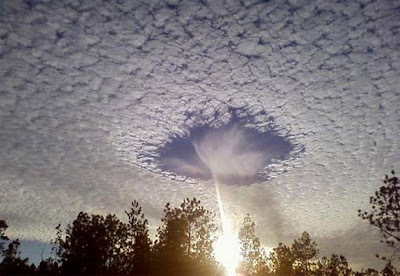 Photographs of hole–punch clouds, a rare meteorological phenomena. Note that streaked clouds within atmospheric holes have the semblance of an "angel". One newspaper article indicates that witnesses saw an "angel". XIII. MIRACLES AND SCIENCE. It should not be forgotten that, with no inconsistency to Catholic theology, God does use natural phenomena, however anomalous, to effect His miracles. Very likely, for example, it was a optical meteorological effect that made the solar disc "dance" at Fatima. For this, see the groundbreaking book by Fr. Stanley Jaki . To be sure, such comparably strange atmospheric phenomena have been recorded in the scientific literature to as far back as 1887. Any scientific explanation of a miracle is, obviously, secondary to the miracle as such. But the "materiality of the miracle" cannot be relegated as irrelevant. Why? Because the material manifestation of alternating atmospheric colourations at Fatima on October 13, 1917 is what prompted many skeptics to religious belief. Had they not physically observed that unusual atmospheric condition, they would have figured Lucia, Jacinta and Francisco to be frauds. How could three simple sheppard children, who knew nothing of science, predict such a thing unless told by Our Lady? Although secondary, the materiality of a Church–approved miracle must nevertheless be affirmed, otherwise a negative or (even) Manichean view of the material world arises. Indeed, prudent genius that she is, the Holy Church utilizes scientific experts to aid in the substantiation or refutation of claimed miracles. XV. 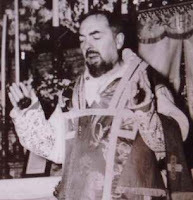 THE PADRE PIO CONNECTION. Mr. Vitolo's wife Grace was from Boston (now deceased). She first came to know Joseph in 1961, but in the few years previous she learned about a certain Italian priest named Padre Pio (Francesco Forgione, 1887–1968), now a world famous saint (canonized in 1999). Grace began writing letters weekly to the saint. She was aware that Pio never read these many letters, however one of his assistants did, and invited her to Italy. Grace went for 3 months and managed to get confession from Padre Pio three times. During one confession, Padre Pio reportedly said to her that the name of her future husband would start with the letter J [31, p. 428]. In the video interview (Video 2, 16:23+), Mr. Vitolo said that, instead, Padre Pio said "Joe". XVI. A MYSTERIOUS WOMAN. Now jump a few years ahead to 1961. Back in Boston, Grace came to know, at St. Leonard's Church, Carmella Indrisiano. It was through Mrs. Indrisiano that Grace came to know a certain Catherine Passananti (1894–1978). McGreevy [31, p. 429] further discusses: "She suffered through an unfortunate marriage and abandonment by her husband. Her religious life took on an added intensity... Catherine began having visions of Jesus while praying before the Blessed Sacrament and soon developed a life wholly centered on prayer, the keeping of a spiritual diary, and various errands requested by Our Lord." Monsignor Donato Conte has written about Passananti, who is associated with the Secular Institute of the Seven Daughters of the Church . McGreevy continues [31, p. 429–430]: "Catherine and a friend traveled to the Bronx in 1945 to see Mary after reading about the apparitions in the newspaper. Catherine did not speak of her visit for many years, but in 1961 she surprised her friends... by saying that she must visit 'the boy' in the Bronx. 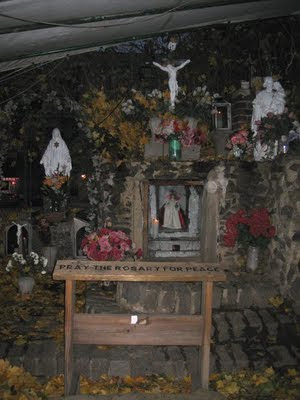 When Catherine and two companions arrived at the shrine in the Bronx, they discovered that Joseph no longer lived at the family home and that he had abandoned the daily saying of the rosary at the shrine. Joseph says that that at precisely that point he felt a curious pull, 'like a magnet', to take the subway from Manhattan to visit his home. The second time he visited he saw an old woman dressed in black outside the front door. It was Catherine; she told Joseph that 'Our Lady wants you to return to the shrine' ". Mr. Vitolo relates this episode in the video interview (Video 2, 14:40+). It was at the Shrine, in 1961, that Joseph Vitolo met his soon to be wife, Grace, and to this day he has resided at 3194 Villa Avenue, The Bronx, New York. XVII. CREDIBILITY OF MR. VITOLO. From all the information that TH2 has examined, Mr. Vitolo appears to be a good and loyal Catholic. He loves Our Lord and Our Lady, respects the Pope, he prefers Holy Communion on the tongue, he prays the Rosary at 4:30 am every day at the Shrine, he works in a hospital and helps people, and, despite the difficulties of his life, is very accepting (even jovial) about his circumstance. In Video 2 at 26:10+, he says: "I got nothing nothing nothing". When asked: "How could life be better for you now? ", he answers: "It's too late", and then laughs. One other important point to mention: Mr. Vitolo/The Shrine "do NOT accept nor solicit financial donations". This has always been the case since 1945. TH2 does not pronounce his view on this matter and leaves readers to decide for themselves. 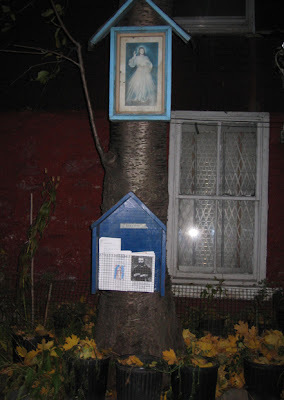 If there are any readers of this article who had some connection or experience related to the "Bronx Miracle", or have gone to the shrine, TH2 would be interested in what you have to say – especially on the "missing bead" episode. Please feel free to comment, whether a believer or not, whether unsure or critical of the happenings in 1945. 1. J. Porcelli, "Mary in the Bronx", Catholic Worker, December 1945, vol. 12, pp. 1–2. 2. "By the Way", Catholic News, November 17, 1945, p. 8. 3. "Boy's Story of Seeing Vision of Virgin Draws devout to Spot in West Bronx", Bronx Home News, October 31, 1945, pp. 1–2. 4. G.F. O'Brien, "Nightly Throng of Devout Reaches 500 as Boy Claims Third Divine Visitation", Bronx Home News, November 1, 1945, p. 2. 5. G.F. O'Brien, "Miracle Created Through Bronx Boy, Mother of Crippled Infant Declares", Bronx Home News, November 4, 1945, pp. 1–2. 6. "'Vision' Scene Attracts 20,000", Bronx Home News, November 13, 1945, p. 1. 7. "Boy Claims 3rd Vision of Virgin", New York Journal – American, November 1, 1945, p. 3. 8. "Friends Believe Story of Vision" , New York Journal – American, November 2, 1945, p. 3. 9. "Bronx Shrine Draws Sick", New York Journal – American, November 3, 1945, p. 3. 10. "'Vision' Returns to Faithful Boy", New York Journal – American, November 6, 1945, p. 6. 11. F. Coniff, "Faithful Believe in Miracle of Bronx lad's Vision", New York Journal – American, November 9, 1945, p. 15. 12. "Boy Waits Last Visit of 'Vision' ", New York Journal – American, November 14, 1945, p. 1. 13. "'Miracle Vision' Due Tonight", New York Journal – American, November 14, 1945, p. 3. 14. "Bronx Lad's Faith Unshaken Despite Failure of Miracle, New York Journal – American, November 15, 1945, p. 1. 15. "Boy 'Sees' Blessed Virgin Last Time", New York Journal – American, November 15, 1945, p. 4. 16. "3000 Crowd Bronx Lot as Boy Reports 4th Vision", New York Post, November 2, 1945, p. 10. 17. I. McDonald, "15,000 See Boy at His Shrine", New York Post, November 14, 1945, p. 3. 18. "Boy's Story of Seeing the Virgin Draws 20,000 to Lot in Bronx", New York Herald Tribune, November 14, 1945, p. 23. 19. "Church No Stand on Story of Vision", New York Herald Tribune, November 15, 1945, p. 25. 20. "30,000 WATCH BOY PRAY; Bronx Youngster Says He Say 'Vision of Virgin' in Lot", New York Times, November 15, 1945, p. 21. 22. "25,000 Watch as Boy Waits Vision of Virgin", Los Angeles Times, November 15, 1945, pp. 1–2. 23. "Family Censors Boy's Story About 'Miracle' ", The Hartford Courant, November 15, 1945, p. 6. 25. "25,000 Pray in Rain Waiting for Miracle", Pittsburgh Post–Gazette, November 15, 1945, p. 2. 28. "Thousands Flock to See U.S. Boy Who Saw Vision", Toronto Daily Star, November 2, 1945, p. 11. 29. "Boy Expects 17th 'Vision'; 20000 Await Bronx Miracle", Toronto Daily Star, November 14, 1945, p. 19. 30. "Devout See Winged Angel But Medium is Plenty Mad", Toronto Daily Star, November 15, 1945, p. 32. 31. J.T. McGreevy, "Bronx Miracle", American Quarterly, September 2000, vol. 52, no. 3, pp. 405–443. In addition to some of the articles noted herein, including the video interview with Mr. Vitolo (see main text), other information on this case was garnered from McGreevy's article. He states (ff. 2) that "I have interviewed Joseph Vitolo about his experiences on three occasions, and we have spoken informally at Shrine events and several times over the phone. The dates of my formal interviews are 23 Mar. 1996, 7 July 1996, and 13 Nov. 1996." It should be subnoted that in 2008 McGreevy, a history professor, was appointed to Dean of College Arts and Letters at Notre Dame by none other than the university's president, Fr. John Jenkins. This apostate was responsible for conferring an honorary degree to pro-abortionist Barack Obama in 2009. 34. Website link for The Concordia Foundation. Paula Gloria broadcasts her gnostic/esoteric philosophy at Rabbit Hole Central TV. Topics covered include 9/11 conspiracy theories, "spirituality", "mind control" and "exotic technologies". Her Twitter feed is here. Her YouTube channel is here. She describes herself as a "Public Access TV Producer and Charity Director". 37. cf. B. Dodd, School of Darkness (New York: P.J. Kennedy & Sons, 1954). 38. cf. P. Maas, The Valachi Papers (New York: HarperCollins, 2003). Originally published in 1968. This book was also made into a film of the same title in 1972, starring Charles Bronson (1921–2003), produced by Dino De Laurentiis (b. 1919). 39. R.W. Marks, The Story of Hypnotism (New York: Prentice–Hall, 1947), pp. 149–150. 40. P. Blanshard, "Roman Catholic Science II", The Nation, May 22, 1948, no. 166, pp. 574–576. 41. In 1945, atmospheric observations, measurements and recording came under the auspices of the then named US Weather Bureau, under the Department of Commerce. 42. J.R. Kinney, "Hole–in–Cloud", Bulletin of the American Meteorological Society, vol. 49, 1968, p. 990; H.M. Johnson and R.L. Holle, "Observations and Comments on Two Cloud Holes over Miami", Bulletin of the American Meteorological Society, vol. 50, 1969, pp. 157–161; P.V. Hobbes, "Holes in Clouds: A Case Study in Scientific Amnesia", Weatherwise, vol. 38, 1985, p. 254–258. 43. S.L. Jaki, God and the Sun at Fatima (Pickney, MI: Real–View Books, 1999). 44. See S. Alexander, "Remarkable Optical Phenomenon", American Meteorological Journal, vol. III, no. 10, 1887, p. 486. Compare also J. Mintern, "A Kaleidoscopic Sun", Meteorological Magazine, vol. 58, no. 685, 1923, pp. 10–11. Moreover, the account of the stationary sun in the Old Testament (Joshua 10: 10–13) can plausibly be explained by a meteorological phenomenon. See D. Camuffo, "A Meteorological Anomaly in Palestine 33 Centuries Ago: How did the sun stop? ", Theoretical and Applied Climatology, vol. 41, 1990, pp. 81–85. "The son of an Italian garbage collector set blasé New York agog in the fall of 1945... Joseph [Vitolo] was automatically assumed to have saintly magic of the great touchers... So great was the hypnotic effect of the situation that the crowd soon began to create its own 'miracles'." LOL on the "glorified lounge lizard" description of Sinatra. I understand he wanted "I Did It My Way" to be sung at his funeral -- which, come to think of it, would have been appropriate at Our Lady of the Angels Cathedral in L.A. (aka the "Taj Mahoney"). A very well done and credible article. 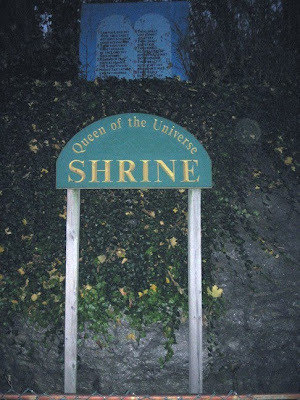 I will talk to my husband about visiting this shrine soon. Thank you, Sanctus Belle. Your kind comment makes all the writing worthwhile. If you do go, please report back at this post - if you so wish. By the way, I meant to mention sooner that I had never heard of the Bronx Miracle, so I found this very interesting. Still, it does seem a curious response, almost like giving the kid the brush. Maybe it was meant as a lesson in humility. I, too, found it interesting - the case as such (thank you). The post was not intended to be so long - but as I started to investigate, more and more details arose that I thought warranted discussion. For me, the most interesting episode is the "missing bead" claim. You are correct on the automat thing - and a buck was worth alot more back then. Never saw the movie. No slight against Sheen - he is one of my intellectual heroes. Thank you so much for this. I've been reading it in bits. I am most impressed with the 'Hole-in-the-clouds' since something similar seemed to be in the news over Moscow earlier this month. You have written a very thorough posting! My pleasure, Lola. Some other interesting cases to come in the future. Astounding research, TH2. Thanks for this; I still can't believe I've never heard of it before now. The episode with the broken beads sticks like a thorn though. The star of David as far as I know is also unique. Don't quite know what conclusion to arrive at. No probs, Christopher. Thanks for dropping by. Yes, the broken bead incident is a tough one. In the video, Mr. Vitolo stated that "scholars, priests" tried to understand the meaning of it. It would be extremely interesting, firstly, to know who these priest-scholars were and, secondly, to find documents outlining what they said. My best guess is that such docs (if existent) are housed deep in the historical archives of the NY archdiocese. You have an outrageous heresy in this article ... the Blessed Virgin pictured with the "star of David" on her. The Blessed Virgin was not a jew, Jesus, Saints Peter, Paul, Mark, Matthew, John, etc. -- none of them were jews. The jew/judaism apostasy OUT OF God's covenant with Abraham started about 200 B.C. when a large group of former Israelites LEFT the covenant of Abraham and fell into pagan talmudism which was carried out of the Babylonian captivity ... namely the Babylonian talmud. Contributing to this confusion is that the Old Testament (English) was falsified in that the words "Judean" and "Judeans" was falsified by "translating" these words to "jew" and "jews". The Latin Vulgate, defined as free from error, accurately reads "Judean" and "Judeans". Detail on Section 39.1 of Immaculata-one.com. Etc. - more on Section 2.3 of Immaculata-one.com. Please read this and tell me what you think. Could the one blue bead be an aborted baby? Thought provoking. It could be. As I alluded in a comment above, it would still be fascinating to read any reports, i.e. interpretations, by those investigating priests on this particular aspect of alleged apparitions. Yes, TH2, it would be fascinating to read any reports. Would love to see that. OK, you can't make this stuff up. Something incredible happened this morning. About two days ago a friend who cleans estate houses gave me a few items from an elderly couple who passed away. Their children didn't want any of their religious items. Included was a very old Rosary which seemed to be from a little girl's Communion. The Rosary are small round clear crystal beads with filigree "Our Father" beads and a beautiful tiny filigree Cross and a filigree heart for the center. It was also broken into many pieces. A few minutes ago I put it all back together and guess what? 1 bead is missing! God bless--We are all children of the most high God. I lived -in the upper Bronx in the 50's-60's and never heard of it - I wish I had. By the way, one dollar in 1945 was worth about twenty dollars today. Back then, the average workman made about 50 dollars a week. Bread was 12 cents, hamburgers a dime, lipstick 18 cents, etc. Prices began to go up pretty fast, though. By 1952, a pair of earrings was $1.20. Yes, you are correct about the monetary worth. Should have emphasized that in my commentary. He is extremely credible, both the video interview, and the depictions of him in the newspaper. I agree. All the information I came across when researching for this article confers a high probability to Mr. Vitolo's credibility. I know this was a long time ago, but I knew Joe Vitolo. Fulton Sheen asked him what he liked the most and Joe told him that he loved the chicken pot pies at the Automat. So he gave him the money to buy some. Unfortunately, Joe passed away Dec. 18th of this year. I was unaware of the loss of Mr. Vitolo. RIP. I will pray Rosary intention for him.